KAUGATUMA, SAAREMAA, ESTONIA–It is always an important moment for a Wooster geology research team when it identifies its final student independent study project. Today Palmer Shonk found his. 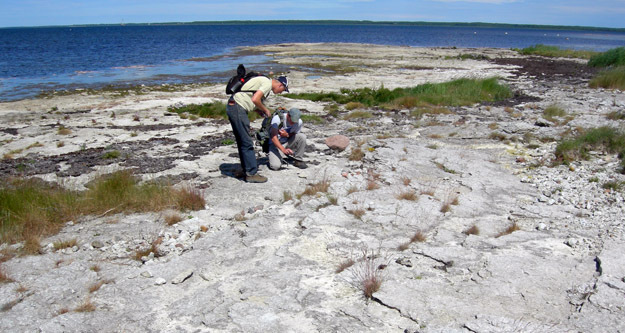 There is a remarkable exposure of a high-energy deposit in the Aigu Beds (Kaugatuma Stage, Upper Silurian) on the Sõrve Peninsula of southwestern Saaremaa island. These rocks have spectacular crinoid materials, including elaborate holdfasts, along with stromatoporoids, bryozoans and brachiopods. The sediments still retain their original dune bedding forms showing the high energy conditions under which they were deposited. Palmer and Rob at the Kaugatuma locality (N58.12409°, E22.19375°). I probably shouldn't point out again the spectacular weather. That would be like bragging. Crinoid fragments (left) and well-preserved stromatoporoids (right) at the Kaugatuma locality. Palmer’s job will be to understand the original organisms and the environments in which they lived and died (a paleocommunity study) as well as the means by which the remains were redistributed and preserved (a taphonomy study). It is exciting material which will make an excellent project. At the end of the day we said good-bye to our generous and thoughtful Estonian hosts Olev and Ingrid Vinn. We are on our own now in Estonia, but they’ve trained us well. They left us at the marvelous Kaali Meteorite Craters, estimated to be about 7500 years old. 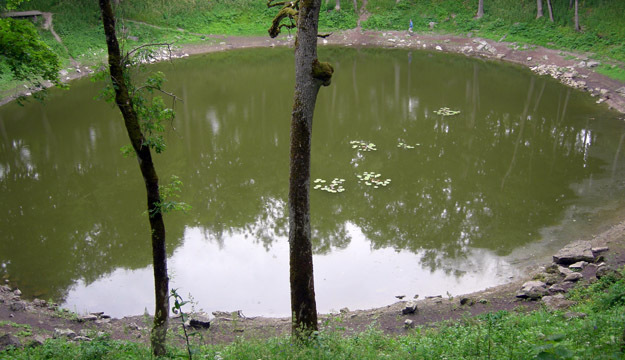 The main Kaali meteorite crater. On the far side of the pond you may see a spot of blue. That is Rob McConnell performing his job as a scale very well.